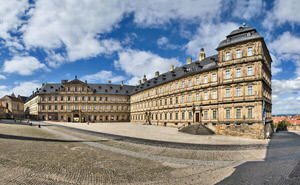 The German city of Bamberg is one of five locations in Germany that managed to remain intact from the bombing during World War II. As a result, today Bamberg has collected within its entire treasury many medieval and historic buildings and monuments. The amazing old part of Bamberg was included in the list of World Heritage by UNESCO in 1993. Bamberg is located in the southwest German province of Bavaria. Through Bamberg passes the beautiful Regnitz River, and after 3 km it joins with the Main River. The town lies 63 km north of Nuremberg and 101 km east of Wurzburg. Bamberg extends over seven picturesque hills, each crowned with a beautiful church. This is the reason Bamberg is often called, "Franconian Rome" and is often compared with Venice, as it is called "Little Venice". For the first time, historical texts refer to Bamberg in 902, these texts speak mainly of the fortified village of Castrum Babenberch on the hill where the cathedral is situated today. At that time the whole area and the village were in the hands of a aristocratic family. In 903, however they lost their great influence as they had a weaker hand in the feud with the Rhine Franconian kind of Konradiner. From the 10th century, Bamberg became an important center and relationship with the Slavic people, especially those of Poland. 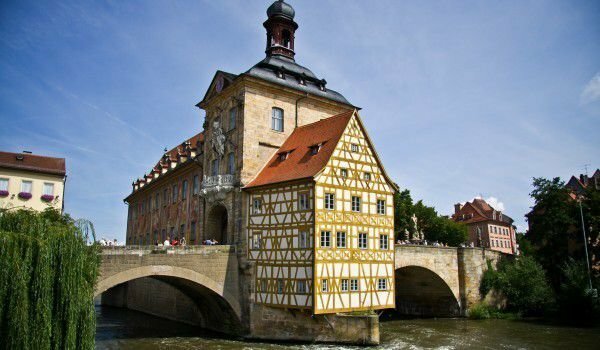 The greatest prosperity of Bamberg grew somewhere in the 12th century when the building of the large part of the medieval buildings took place, which still can be seen in the German city. Then their architecture is strongly influenced by architectural trends already imposed in northern Germany and Hungary. In the late 18th century Babenburg was a major center of the Enlightenment in southern Germany as there lived the eminent philosophers and writers from the rank of Hegel and Hoffmann. As one of the best preserved medieval cities with architecture in the heart of Europe, Bamberg attracts thousands of tourists annually. The first, which is visible when entering is the old city. It can be reached thanks to the beautiful bridge over the Regnitz and Rathaus. The next stop in Bamberg is the Cathedral that is determined mainly in the Gothic style inside. Initially one will be startled by its vast net of detail and rich ornaments sizes. The atmosphere inside is that of a typical church. Today, in this building in Bamberg the public gallery is situated, which is impressive with its gold-painted ceilings. Bamberg is quite famous for its many breweries and manufacture of beer. This is definitely one of the beer capitals of Germany. This city produces the so-called Rauchbier or known in English as smoked beer. The most famous of them, which is produced in one of nine traditional German breweries in Bamberg is, Schlenkerla's Aecht Schlenkerla Rauchbier. This attractive beverage can be tasted in the tavern, located on a street in the Dominican Bamberg.